[dropcap3]A[/dropcap3]nd so it begins, the start of the bumps, bruises, scrapes, and other various physical evidence of “brotherly love”. The afternoon’s love fest started with Zachary trying to watch the cartoon that Jonah was watching and Jonah blocking Zachary’s view. After a few renditions of “get out of my way!” followed by grunting and heavy breathing, I was not surprised when the high-pitched shrieking reached my ears. When I got to the living room I found Zachary looking contrite and trying to console a wailing Jonah. Okay, he was really trying to talk him into not squealing on him. Which of course, Jonah promptly did. 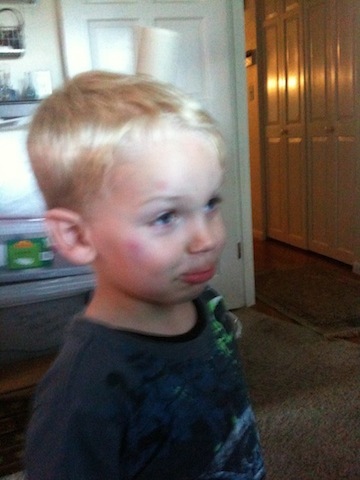 It seems that Jonah had been standing on the couch, and when he wouldn’t get out of Zachary’s way, Zachary pushed him. Off the couch. 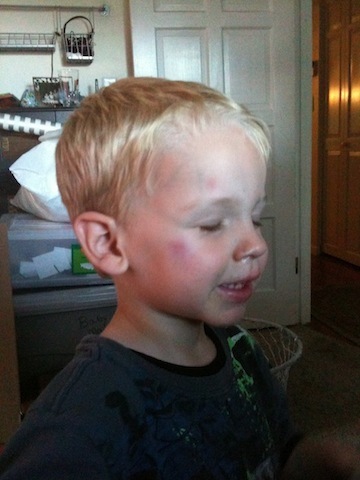 From these pics it’s hard to see how big and dark the bruise was (the little bugger won’t stand sill! ), but it’s several days later and he still has his “trophy”. I’m sure this is just the first of many brother-inflicted wounds to come. I think it’s time to invest in a first aid kit. Or a stand-by EMT.